We are the proud owners of two Tampa Bay Vizsla Rescue dogs. Sweet Allie, who was then about a year and a half old, joined our family the day after Thanksgiving 2015 (which our family will now forever celebrate as “Brown Friday”). Allie is our energetic “party girl” and Kristen’s personal trainer, dancing in circles each morning when she sees Kristen put on her running shoes to head out for a family jog. She is also a classic Velcro vizsla and very diplomatically divides her time between Jeff’s lap (in the mornings) and Kristen’s (in the evenings). 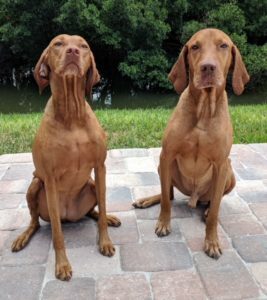 In April 2018, we again reached out to Tampa Bay Vizsla Rescue. This time, sweet Nole (now Olie) was waiting for his forever home. Olie had a hard life before he came to us, having lived outside in the Florida heat for all of his five years. He had also never had the opportunity to develop “house manners,” so we enlisted the help of the same trainer who had worked with Allie, and lo and behold, he has come a very long way. To put it mildly, he is adjusting to the good life. The dog who could not walk on terrazzo floors, wasn’t sure where to go potty, and was terrified of squeaky toys now loves dips in the pool, walking on a leash in a perfect heel, playing “tug” with his sister, belly rubs, and having his very own spot on the sofa (when not in our lap), not to mention stockpiling squeaky toys. We call him “Thumper” for the way his tail beats like a tom-tom whenever you look his way. Olie has a sweet, calm demeanor, big, blocky head, and slightly goofy ways. We have high hopes for him as a therapy dog when he is ready to go to the next level in his training and are so glad to have him as part of our family. As for how Olie feels? To quote Aretha Franklin and George Michael, we believe he knew we were waiting for him, during all of those hard years.